Today was Pink Shirt Day in Canada. This anti-bullying awareness day began in 2007 after a grade nine student was bullied for wearing a pink shirt to school. Before I had my children I taught elementary school. One year I taught a multi-leveled grade one/two class. It was a wonderful year, with students ranging in age from six to eight. We talked a lot about being kind, helping each other and standing up for each other. 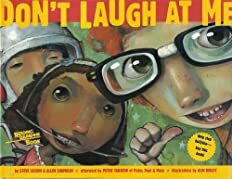 When the kids and I read the book, listened to the song and eventually sang the song during a school assembly I was struck by how seriously the children took the anti-bullying message. As adults, we think we’re pretty smart. We may be educated, well-travelled and have tons of life experience. But you know what? Those six and seven-year-old children had a far deeper grasp of basic kindness than many, many “grown-ups” do. As a kid, I just assumed that some day everyone would grow up. Unfortunately this doesn’t always happen. I’ve been talking to a lot of friends lately about how mean and judgemental women are to each other and I’m sick of it. How can we teach our children to be accepting and kind but then turn around and rip another person to shreds? I hope that every parent who sent their children off to school in pink shirts thought about why they were really doing it. We need to stop and think about the way we treat others…not just the people we love but the people who are hard to love, the ones we are tempted to laugh at. Our children already have this figured out. Lovely post Murphy. I haven’t heard of Pink shirt day, but is sounds like a great message. I totally agree about women being too judgemental of each other. It has to stop. You are a beautiful person, Anna. No wonder I immediately liked you! I loved this post, and the teachable moment involved. I wish I could get the book from the library! My daughter’s Kindy teacher said that the whole concept would be above the kids… I disagree. I wish I could share that book with her. Thanks for posting this and all your blogs, I enjoy them. Great post. Third grade was a big year for my son when kids seemed to begin to notice differences. It’s hard but important to talk to your kids about bullying and how to deal with it. Sounds like a great book. Thanks for sharing.